Do you think that LittleBigPlanet 2 would be perfect for a WiiU game? Sony thinks so, but rather than bringing the game to the new WiiU console, an upcoming DLC pack for LBP2 will introduce cross-controller play between the Playstation 3 and the Playstation Vita. This is great news to gamers who already own a PS3 and a Vita, but probably sad news for WiiU owners who don't have those two consoles. The Cross-Controller Pack works just like how it sounds: it lets players use their Vita as a controller for their PS3. It will make full use of Vita features such as the front and back touchscreens. Even more intriguing is that Sony has announced that LBP2 is just the first game to implement Cross-Controller play - which means others are planned. 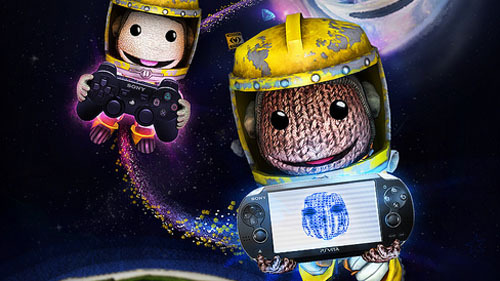 The LBP2 Cross-Controller Pack will also include a new adventure which features Sackboy, space pirates, and space treasure. It will of course also add new level-creating tools for the community to experiment with creating their own cross-controller play levels. The LBP2 Cross-Controller Pack is due out next Tuesday, December 18th. The DLC will be $4.99, delivered through PSN. It will require a PS3, Vita, and copy of the game to play.